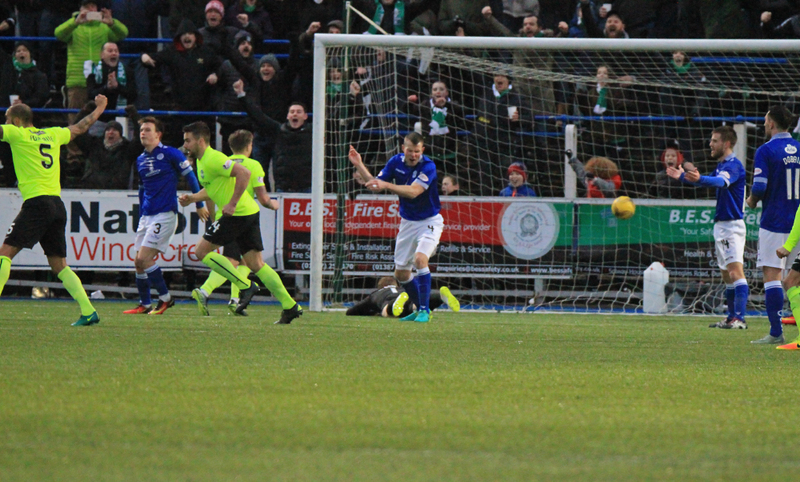 Queens` first home game of 2017 turned out to be a losing one after League leaders Hibs left Palmerston with all three points courtesy of a John McGinn deflected goal. However, for a good part of the game Queens more than matched the team from the capital, and although the visitors had more of the ball, Queens kept themselves in the game right until the end and in a spirited final last 15 minutes they created problems for the Hibs defence although they were never able to produce a clear cut chance that might have yielded a point. Following victory at Dumbarton last week, Queens made one change to the their starting line-up as fit again Jordan Marshall returned to the defence, and for the majority of the fans it was the first time that they had seen all four recent signings, John Rankin,Scott Mercer,Joe Thomson, and Dom Thomas, as they all made their home debuts. On a cold and wet day in Dumfries,Queens started with a 4-5-1 formation with Stephen Dobbie playing as the lone striker, and for large parts of the first period of the game the congested midfield area helped Queens, but eventually the guile of both McGinn, and Shinnie began to give the away side a slight edge and after 9 minutes they had the first half chance of the game.McGinn fed Gray wide on the right and the full back`s delivery picked out Holt but he could only lift his effort over the bar. The home side won their first corner of the game 15 minutes in following good work by Mercer, but the resulting set-piece came to nothing as referee McLean penalised Darren Brownlie for pushing.There were signs that Dom Thomas might have the beating of both Stevenson and McGregor in the early stages and the on loan winger showed some good skill and a decent turn of pace to get himself into a good position to cross, but slightly off balance as he delivered his cross he was unable to find the accuracy needed. The away side responded with a very quick and direct break and Keatings went very close to opening the scoring when his strike from the edge of the penalty area only just cleared the crossbar.This was a good spell for Hibs as the impressive McGinn began to take control of the game and most of Hibs play was going via the lively midfielder, and after Shinnie hit an effort wide of the target, a delightful ball from McGinn picked out Cummings whose attempt at an overhead kick lacked finesse and ended well wide of the Queens goal. Most of the possession was with Hibs, but to their credit Queens remained organised and compact at the back although having just one striker did mean that they were having to do more defending than they would have liked to do. Minutes before the interval Hibs might well have gone ahead when a swift break allowed Stevenson to pull the ball back invitingly into the path of Shinnie, however his powerful strike from the edge of the box was always rising and never looked like troubling Lee Robinson. Plenty of possession and passing football from the visitors, but Queens certainly gave as good as they got in what was a fairly even and entertaining first half. Queens got the second period underway attacking the Portland Drive end and unfortunately all the good work that they had done in the first period was undone just 7 minutes into the half when the visitors broke the deadlock following their first attack of the half. Having won a corner on the right Keatings` deep delivery picked out the run of McGinn and his shot on the volley was deflected past a despairing Robinson. The goal was a real blow to Queens but straight after the re-start they had what was probably their best chance of the game and almost instantly drew level and the fact that they didn`t was only down to a fine save from Laidlaw who reacted superbly to push away a shot from Joe Thomson. With Queens chasing a leveller the game became more open as they pushed forward and of course this allowed Hibs to exploit the spaces left by the home side and with McGinn, Fyvie and Shinnie all capable of picking a pass, the away support in the crowd of 3007 must have been looking forward to their side going on to extend their lead and win the game comfortably, and although they probably should have scored again, Queens stuck manfully to their task and the result was always in doubt right up until the final whistle. On the hour mark Robinson produced a smart save to keep out Holt`s flick following a Keatings free-kick, and the Queens `keeper was busy again as he turned away a deflected drive from full-back Gray. Queens looked to the bench to try and find a way back into the game when Derek Lyle replaced Dan Carmichael on 64 minutes. It had been a difficult afternoon for Carmichael who was up against a solid display from Hibs captain, Gray. A second change for the hosts saw Lyndon Dykes replace Kyle Jacobs and the substitute was straight into the action when he combined with Lyle to set up Dobbie just inside the area, but the bouncing ball was hard to keep under control and he could only lift his effort over the bar.The first caution of the game saw Fontaine booked for a late challenge on Lyle, and minutes later Gray followed him into referee McLean`s notebook after a foul on Dykes. A quick break down the left by Marshall saw him get beyond Gray and deliver a well placed cross that picked out Lyle, but the striker could not direct his header goalwards, and as the game moved toward it`s conclusion there were half chances for both Dykes and Brownlie but on each occasion neither could get enough power on the ball to cause Laidlaw any problems. Jordan Marshall was chosen as man-of-the-match and there was an impressive home debut for young Joe Thomson in the heart of the midfield. So the first game at Palmerston in 2017 ended in defeat and the long overdue home win is still to materialise, but there was plenty to like about today`s performance and the chance to get that win comes up next Saturday when Queens host Morton, and hopefully that will have a better outcome than the last time Morton visited Palmerston. 14:27 One change for Queens this afternoon. Marshall returns from injury and Higgins drops to the bench. 14:34 Hibs: Laidlaw, Gray, Fontaine, McGinn, Holt, Stevenson, Keatings, Shinnie, McGregor, Cummings. 6 min Good start to the game by both sides but no chances of note yet. 6 min Cummings squares the ball in the box but is cleared by Brownlie. 9 min Hibs beginning to ask question here. Holt fires over the bar from eight yards. 14 min Mercer forces a corner but from the resulting set-piece referee Steven McLean blows his whistle for a Hibs free-kick. 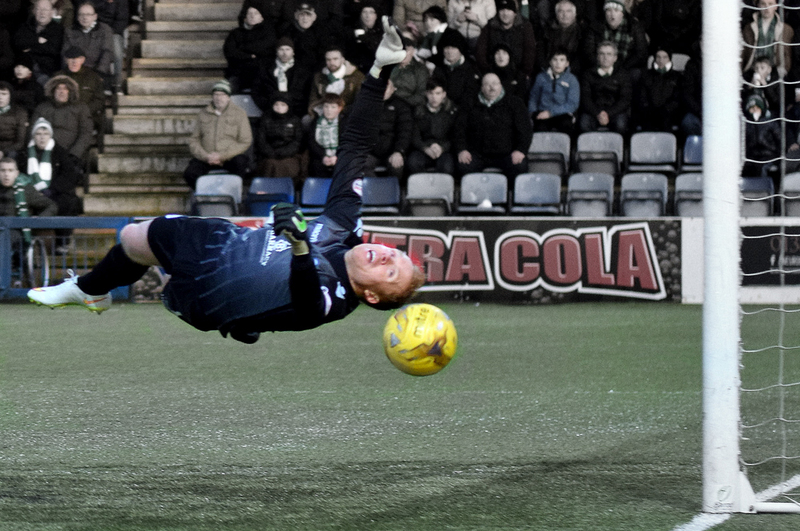 16 min Thomas using his skill to get past Stevenson but his cross can`t trouble the Hibs defence. 18 min Keatings fires an effort just over Robinson`s bar. Still 0-0 here. 23 min Shinnie bursts into the box but his effort goes inches wide. 30 min Rankin`s cross is collected by Laidlaw. 40 min Shinnie`s shot from long rnage is always rising over the bar. Still 0-0 here. Half Time We are just moments from the second half. 55 min Corner is whipped in and McGinn`s deflected strike goes past Robinson to make it 1-0. 59 min Holt`s flick is superbly turned out by Robinson for a corner. 65 min Gray`s deflected shot is kept out by another superb save from Robinson. 73 min Dykes passes to Dobbie but the striker overhits his shot and flies over the crossbar. 75 min McGinn`s low effort drifts inches wide. Still 1-0 Hibs. 77 min Lyle is brought down by Fontaine and the defender receives a yellow card. 82 min Dykes` header is comfortably caught by the keeper. 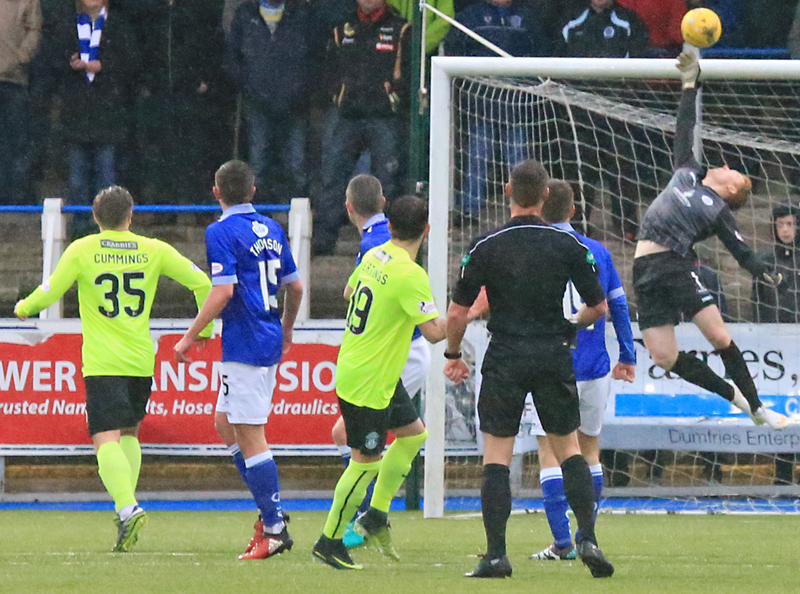 83 min Ball is whipped in from the left but Brownlie can`t direct his header on target.